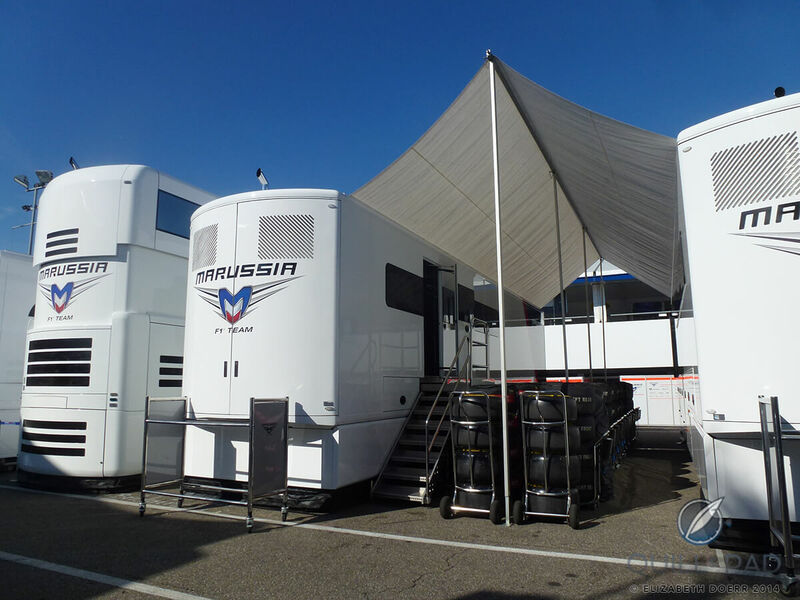 It was sunny and it was very hot, but I hardly noticed either as I followed Claude Greisler, Armin Strom’s head of technology, past encamped Formula 1 fans and through the entrance of Germany’s Grand Prix-hosting Hockenheimring in Germany. The first thing I noticed on the way in was the Armin Strom logo among the Marussia team’s sponsors and suppliers. The next thing I noticed was how popular Greisler seemed to be as we came into Marussia’s dedicated space as one of the eleven Formula 1 teams in the race: many of the managing staff and engineers greeted him jovially, a few even proudly displaying their wrists to show us their most recent Armin Strom acquisitions. I learned later that a number of the timepieces I saw that day are custom creations. The original timepieces made by Armin Strom are a tale for another day, but suffice it to say for now that in the 1980s and 1990s they stood out for their unique-piece character based on heavy skeletonization and engraving. And the watches were very, very rare as Mr. Strom made – and sold – each piece by hand. After learning about how the box, pit and “garage” are set up – “no photos of the Ferrari hybrid engine technology, please” – Greisler and I headed to our designated spots and put on the headphones that allowed us to both follow the interaction between the engineers and the drivers, and protect our ears from the massive noise inherent to this working environment. What struck me was the precise way that the team of 60 plus the two professional race car drivers worked together to ensure that the cars were perfectly adjusted to the conditions and track ahead of the actual race. “Much like a precision timepiece,” I thought as I observed humans and machines working together in harmony to create something extraordinary and high-performance. 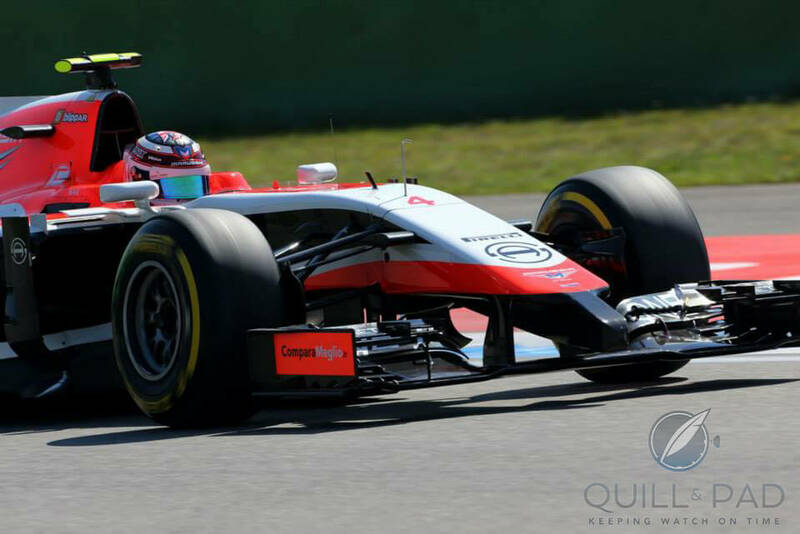 We concentrated on Max Chilton, the 22-year-old Marussia driver sporting the Grand Prix’s number four. Though I couldn’t tell if Chilton was wearing his watch while driving, I did spot the Armin Strom logo on his helmet and car. There was a slight problem with Chilton’s motor, so he came in and out of the garage a lot, patiently waiting while the engineers tweaked the mechanics. After which he’d race out again to test the modification. Chilton has had a solid 2014 season so far, and it was obvious to me that he worked well with the team to attain the best possible results. When the allotted time for the morning session was over, Chilton came over to exchange a few words, and I noticed that he had his watch on, a Gravity Racing model. Aside from its cool, modern, skeletonized look, this watch is extraordinary in a major detail: its bridges are made from authentic motor block material originating in a Marussia F1 team race car. “This means I have a piece of that car forever,” Chilton remarked. As we headed over to the team’s hangout, a sort of mobile restaurant lined up in a row with the other ten teams’ hangouts, we had the chance to chat with him for a bit. I learned that Chilton is a fan of watches, and one of the first orders of business for him was to admire Greisler’s Gravity Date Fire tourbillon model. Chilton is racing only in his second F1 season. In 2013, he set a record by becoming the first rookie to complete all 19 races of the season. Marussia’s second driver, Jules Bianchi, has also had a solid 2014 F1 season. Perhaps that could be chalked up to his own good luck charm provided by Richard Mille. In fact, I spotted Richard Mille fairly often in the pit lane on the wrists of both Bianchi and Williams driver Felipe Massa, as well as in the brand’s function as main sponsor for the Lotus team, including driver Romain Grosjean. All too soon, Greisler and I were picking our way back through the midday heat to begin the journey home, excitedly discussing our adrenaline-filled experience. As we headed back, I sadly realized I would only get to wear the One Week Air Special Edition, which I had borrowed for the day, for a few more minutes. This timepiece is an exciting edition of the practical One Week, which, as the name already suggests, has a seven-day power reserve. Powered by the in-house, manually wound Caliber ARM09, its off-center time display is already an eye-catcher. The additional movement skeletonization (precipitating the predicate “special edition”) along with the new grey hornback crocodile leather strap really adds a lot to the look. The One Week Air Special Edition is housed in a 43.4 mm stainless steel case, which even on my miniscule wrist looked and felt proportionate. A playful detail that I particularly like on all Armin Strom watches is the case “lip” found at the 6 o’clock position, which leaves room for personalization and engraving and simultaneously alludes to Mr. Strom’s past, when just about every watch he created was a personal one intended for its owner. The Marussia team left Germany in ninth place of the Constructors’ Championship with both drivers having finished the race (this is something to cheer in the cutting-edge world of Formula 1). I left Hockenheim with some great memories. Honestly, I went home and watched Rush. I guess I just couldn’t get enough. For more information, please see www.arminstrom.com/en/collections/one-week-air.